When Penga-Sis came to visit, she brought some of her Christmas presents to try out with me. If there's one thing we have in common, it's the complete fascination with "projects" and "food", especially if those two words are in the same sentence. 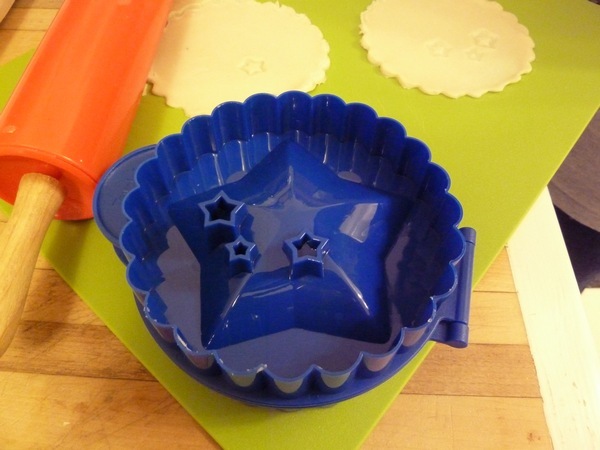 First, we test out a star-shaped tart mold. 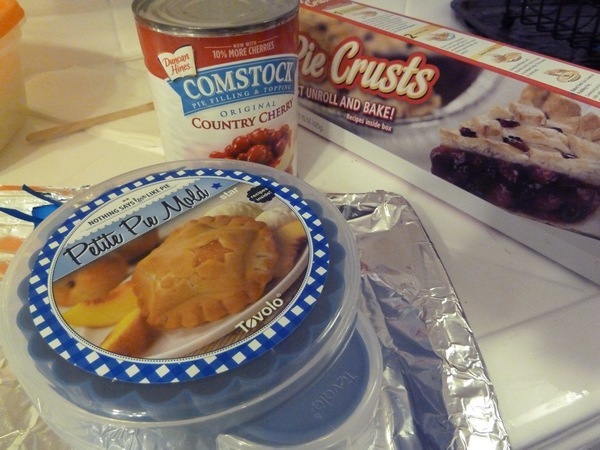 Roll the dough out, use the cutter on the mold, press the dough inside, and fill with a little Comstock filling. Close and repeat! 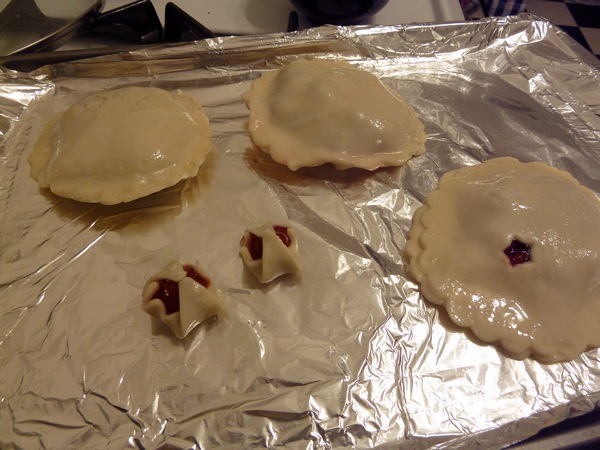 We found that the shapes (especially the little star "air vent" on the inside) didn't really cut out cleanly, but that may have to do with the irregular thickness of our pie dough or something. They were...delicious! Though we put too much filling in (best part anyway), so it kind of popped out the sides a bit. Though I guess they definitely didn't retain their star shape. Oh well. 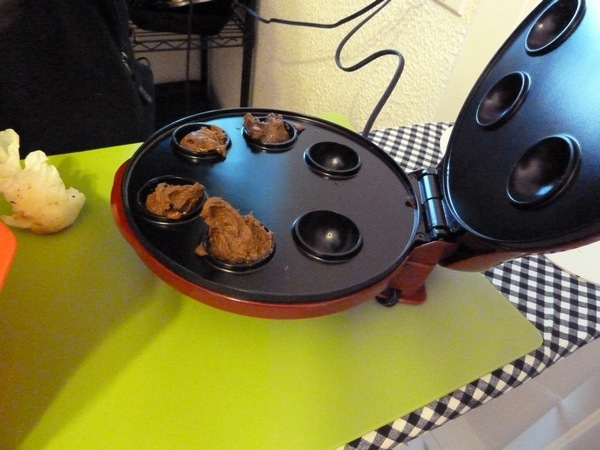 Anyway, you might have noticed something else from the above picture, which would be Penga-Sis's second baking goodie, the cake pop maker! We first tried a from-scratch recipe that came with the instructions. 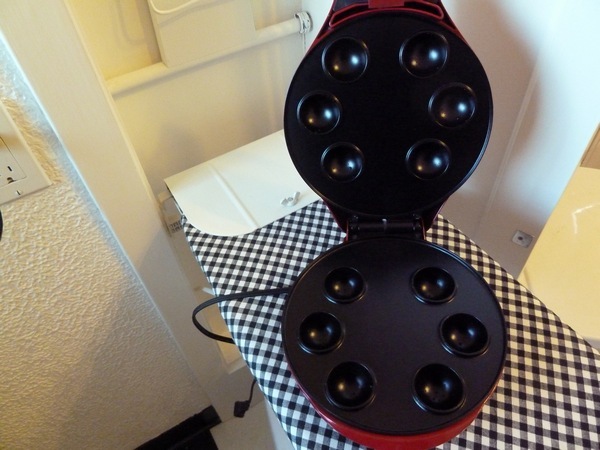 We filled each compartment with batter, then closed the lid for five minutes. I didn't have proper sticks at the time, so we used popsicle sticks. But it wasn't much help. And also looks like it's growing something funky. :P Starbucks cake pops, these are not. 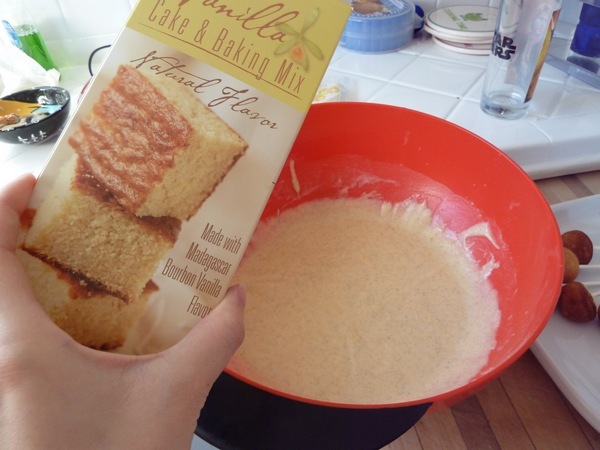 Anyway, the next day we bought some cake mix and tried again. Trader Joe's vanilla cake - soooo tasty! I ate more batter than pops, sadly. 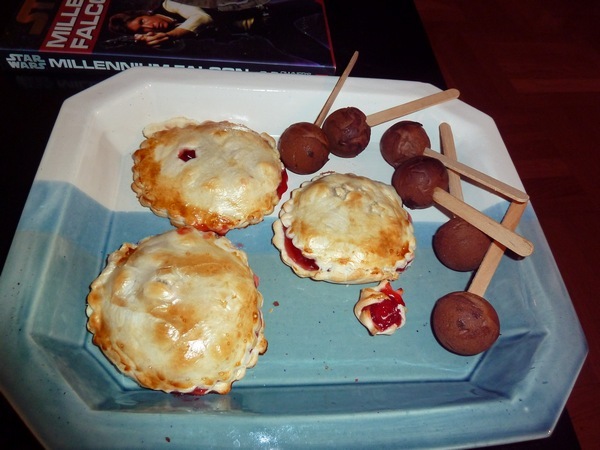 They weren't as perfectly round as the chocolate pops, mostly due to the fluffiness. As soon as we put them on the plate to cool, a dent would form on the side! But they were still more or less round, and 100 times tastier, so all was well. 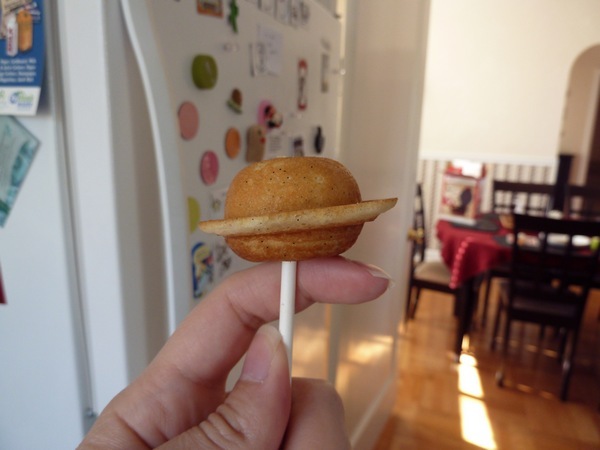 If you put too much batter in the cake pop maker, you get cake pops that look like Saturn! 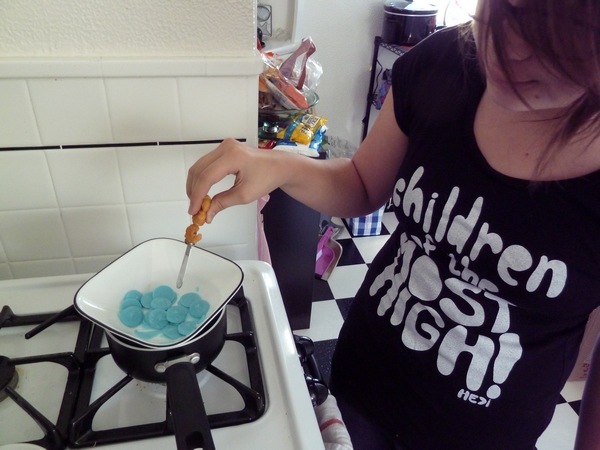 While I made cake pops, Penga-Sis fired up the oven to melt some blue candy melts. 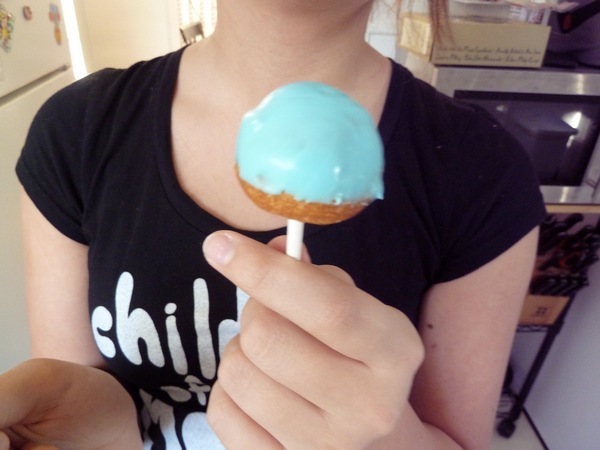 Then she coated the pops with cute blue frosting! We stuck them vertically in a piece of styrofoam to let the candy cool and harden. It took a while, but was much better than the chocolate pops from the day before! 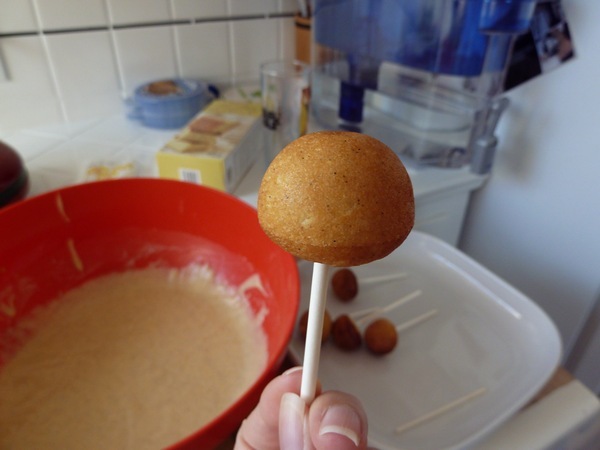 Cake pops are a lot of work for very little cake. They're cute and good for portion control, though! And it was a fun experience to make everything with Penga-Sis. Next time we should have more frosting colors and more than just one bottle of questionably-aged green sprinkles. Really. Who has just one bottle of green sprinkles?! I guess that would be me. 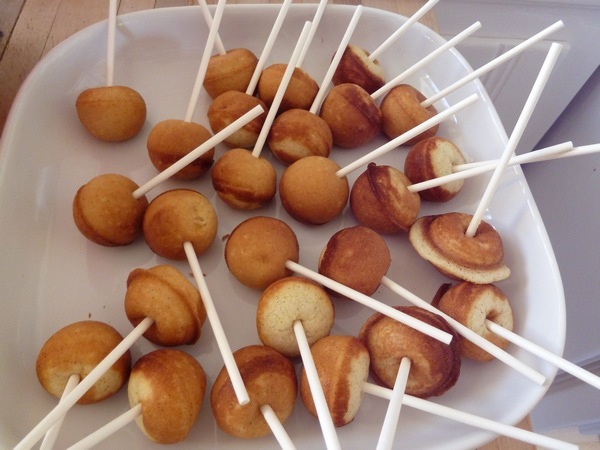 Cake pops: are you a fan? 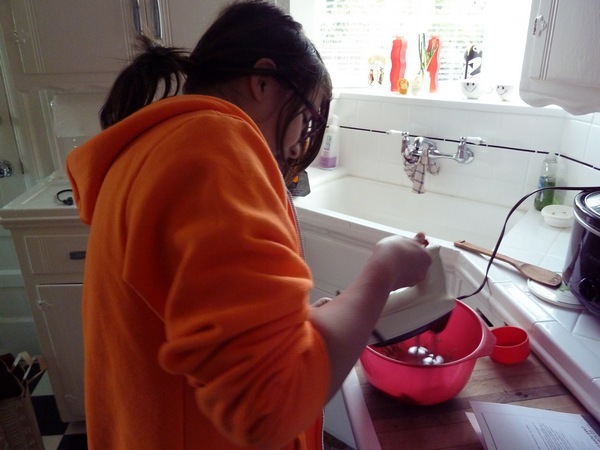 Or are you a why-bother-cooking-it-just-hand-me-the-bowl-of-batter kind of person like me? Looks like you had a fun time with your sister! 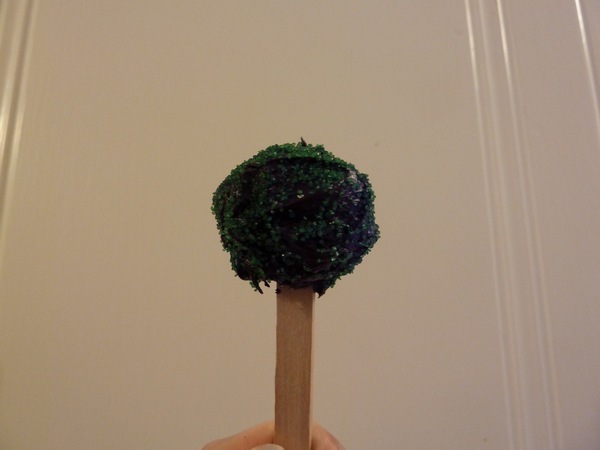 I've never made cake pops, but one of my friends did for their wedding favors and they were tasty. love the saturn cake pop! Hey there! 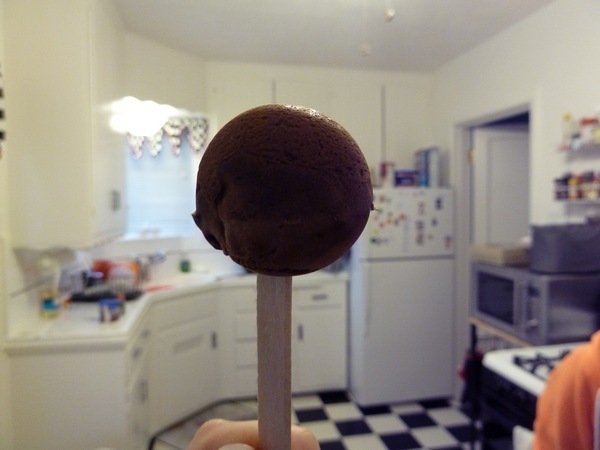 No wonder the cake pops were so bad lol - you're supposed to take regular box cake mix, disintegrate it with your fingers as fine as possible, and add 1/3 of a tub of frosting to the mix so it has a clay-like consistency! Check www.crickpop.com for more helpful hints and stuff but don't give up! They're actually easy once you overcome everyone being hush hush about them!